A memorial plaque dedicated to the Second World War hero Raoul Wallenberg (1912 – ¿) was placed on the wall of the Austrian Embassy in Budapest. Wallenberg, a Swedish diplomat, was arrested in that building by the Russian troops on January 17, 1945 after rescuing tens of thousands of Jews condemned to death by the Nazi regime. His fate is still unknown. The ceremony was attended by Baruch Tenembaum, founder of The International Raoul Wallenberg Foundation (IRWF) and Ferenc Orosz, Chairman of the Hungarian Raoul Wallenberg Association, among other personalities. Dr. Yoav Tenembaum (see photo), member of the IRWF executive board, delivered a speech on the occasion. The President of Hungary, Ferenc Madl, is himself a member of the Honorary Board of the IRWF along with others world leaders such as the Dalai Lama; Mohammed VI, King of Morocco; Rudolph Giuliani, Mayor of the City of New York; Nina Lagergren, Sister of Raoul Wallenberg, as well as Elie Wiesel and David Trimble, Nobel Peace Prize laureates. The IRWF counts with the full support of UN Secretary General Kofi Annan, 2001 Nobel Peace Prize. A non-profit NGO, the IRWF’s main recent activities include the setting up of the International Angelo Giuseppe Roncalli Committee. Roncalli (later Pope John XXIII) as Papal Nuncio in Istanbul during the Holocaust, saved the lives of thousands of Jews by granting them documents attesting to their supposed baptism. The conclusions of an exhaustive academic research about Roncalli’s deeds in favor of persecuted Jews will be presented to Pope John Paul II in the course of 2001. In the last years Mr Tenembaum has met with several world leaders such as Kofi Annan, Pope John Paul II -accompanied by the late Emilie Schindler-; Johannes Rau, President of Germany; Lech Walesa, and Cardenal Angelo Sodano, Vatican Secretary of State, among others. Dr. Yoav Tenembaum, an accredited journalist and political analyst based in Israel, holds a doctorate degree in Modern History from Oxford University. His doctoral thesis was on the international relations of the Middle East and his masters degree is in International Relations from Cambridge University. 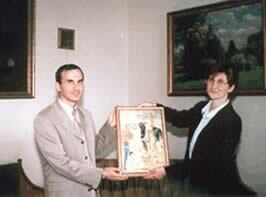 Dr. Tenembaum held several meetings with top rank officials of the Hungarian administration. At the Presidency of Hungary he presented to the Hungarian President Ferenc Madl the canvas ‘Basílica de la Anunciación’, a work of art by the renowned Argentinian painter Raúl Soldi, as a sign of recognition to the work of Dr. Madl promoting peace and understanding worldwide. Dr. Tenembaum also held meetings with Dr. Andreas Tombor, Senior Security Policy advisor to the Prime Minister, Viktor Orban and with Dr. Attila Demkó, a senior political advisor of the PM’s office.